Recorded on the Sarah Graham Kenan Memorial organ (C.B. Fisk, Op. 75) in Crawford Hall, UNCSA, this recording includes three works recorded for the first time! Two tracks include works for trumpet and organ with Judith Saxton. Composers featured are Franck, Gervais, Grigny, Ted Oliver, Margaret Sandresky, and Aaron Travers. ​(free shipping worldwide) or by contacting me here. Timothy Olsen teaches a studio of high school, undergraduate and graduate organ majors as the Kenan Professor of Organ at the University of North Carolina School of the Arts and Associate Professor of Organ at Salem College in Winston-Salem, North Carolina. Dr. Olsen also serves as Cantor at Augsburg Lutheran Church in Winston-Salem, where he oversees the music program directing the adult choirs, playing for services, and directing a music staff of a Director of Youth Music and Handbells and a music intern. 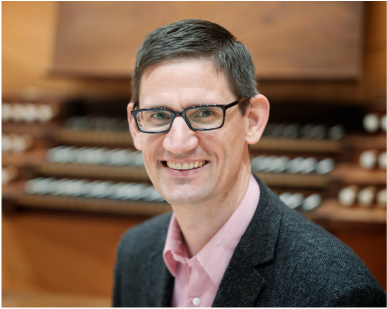 A graduate of Concordia College (Moorhead, MN) and the Eastman School of Music, Dr. Olsen enjoys a multi-faceted career in organ pedagogy, performance, and sacred music. Dr. Olsen is an avid proponent of 20th and 21st century music having premiered numerous compositions for organ and for organ/trumpet duo. He also enjoys performing baroque music on period instruments - both as a solo organist and as a continuo player. Dr. Olsen is available for recitals and workshops. Please contact him via the Contact page.